I came across an old article on Takoma Junction while researching a new one, on Maryland state investment in our community. With the City of Takoma Park's revived Takoma Junction revitalization initiative, we have private investment, from the Neighborhood Development Company, on tap. That's a good thing, something we've been working toward for years. 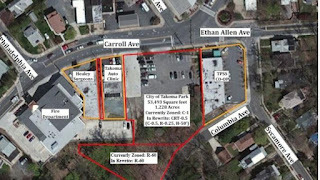 After a decade of failed revitalization, things started looking up for an ailing section of Takoma Park yesterday morning when the governor, a posse of politicians and an army of activists met in a vacant lot and outlined a deal. Gov. Parris N. Glendening (D) said he would be favorably disposed toward Takoma Park's request for $1 million in state economic development funds if the city could demonstrate there also was significant new private money ready to be invested. The state funds, in the form of a $500,000 grant and a $500,000 loan, would be used to spruce up Takoma Junction, an underachieving stepsister of the city's old town, which was revitalized a dozen years ago. The old town is situated where Laurel and Carroll avenues converge, and Takoma Junction is located a few blocks up Carroll, by the intersection with East-West Highway. Takoma Park handed him his highest margin of victory in the state: 91 percent. "I won't forget this at all," said the governor. Glendening was on a tour of Montgomery County yesterday, promoting his efforts to revitalize the older neighborhoods and "urban cores" of Maryland. Another scheduled stop was in Friendship Heights, where, he said, his vote margin was almost as overwhelming as in Takoma Park. 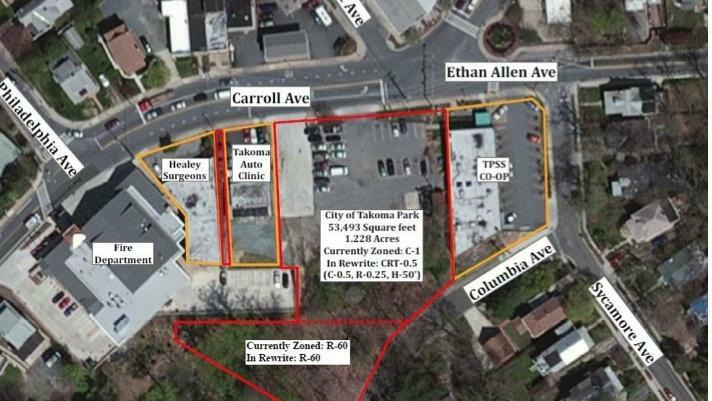 Takoma Park already plans to spend $515,000 next month to acquire a vacant 1.4-acre lot in Takoma Junction and convert it to interim parking while seeking a developer for the property, said Beverly Habada, the city administrator. The money includes $200,000 in block grant funds from Montgomery County and a $315,000 city bond, which will cost the city more than $27,000 a year in debt service, Habada said. Montgomery County officials have discussed relocating the Takoma Park Volunteer Fire Department from Takoma Junction. City planners said that if that happens they might seek to acquire the fire hall for a cultural center, but they said no source of funds has been identified for that project. The $1 million from the state would be used to acquire other property in the area and spur creation of a commercial, retail and residential hub, said Del. Peter Franchot (D-Montgomery). "Without public investment, you won't get the right kind of private investment," Franchot said. Past proposals for the property have included a Pizza Hut and a chain drugstore, both violently opposed by city residents, who said they wanted a grocery store most of all. Residents banded together to create a community development corporation to foster controlled development of the Junction. A leading contender to move into the Junction -- if financing comes together -- is the Takoma Park Silver Spring Food Cooperative, a booming vegetarian market in nearby Silver Spring.